Two-person team heaviest one-day bag tournament. All competitors must possess and have on their person a valid Manitoba Fishing License or Treaty Card. All competitors are equal and will abide by Manitoba Sportfishing regulations and specifically all rules put in place for the Northern Manitoba Walleye Championship. At minimum one team member must be eighteen (18) years of age or over. Youth competitors will be permitted with written consent from a parent/guardian. $300 per team entry fee. Entry includes free supper ticket for each team member during the awards presentation. Additional tickets for spectators/family etc. will be available for purchase at minimal cost. Boat numbers/starting order will be assigned as entries are received. Official notification of such via email from Tournament Directors will be sent once funds and signed entry forms are received. Entries will continue to be received until take-off on the morning of the event unless the maximum number of boats has been reached before that time. Tournament fishing hours will be from 8:00am to 4:00pm. All times are based on GPS. Take-off will be a number ordered trickle start called out over a public address system. Boats taking off before being called will be disqualified. Boats missing their call must wait until all boats in the field (or their flight if applicable) have taken off before leaving. The competition will take place on Paint Lake, MB and all waters accessible on boat by water from the Paint Lake Lodge Marina take-off point. Pre-fishing will cease at 4:00pm on Saturday, September 1, 2018. No boat shall travel tournament waters or actively fish after this time until take-off time the following morning. Persons travelling to and from accommodations/property on Paint Lake after pre-fishing has ceased must only do so for the purpose of commuting and not to actively locate fish or conditions. Boat inspections at the Paint Lake Lodge Marina will commence at 7:00am. Rules meeting will take place on Saturday September 1, 2018 at 6pm at TBD. Mandatory attendance from all teams is required whereby at least one team member is present to check-in, receive tournament package, and to ensure full comprehension of tournament rules and any updates if necessary. Tournament volunteers will conduct boat inspections at the launch prior to each boat entering the water and will flag and record each boat as completed. Failure to have boat recorded as inspected before taking off will result in disqualification. Volunteers will check for: appropriate Personal Floatation Device for each team member; possession of restricted live bait fish; ensuring livewells are empty; contents of all boat compartments to be in accordance with tournament rules, properly affixed boat number cowl stickers. Only motorized watercraft with a working livewell (aerated covered container to retain live fish) permitted to be used in the competition. Pontoons, canoes, houseboats, kayaks and other similar personal or cumbersome watercraft are not permitted. Tournament Directors reserve the right to refuse entry or disallow use of any boat, motor, or equipment deemed unsafe, unsuitable, or contravening of tournament rules. Use of underwater cameras are prohibited during tournament hours. Competitor boats must not come into contact with any other boats on the water whether they be other competitors or not. The passing of items from one boat to another will result in disqualification. Boats will be respectful and sportsmanlike in regards to other competitors and property on tournament waters. A twenty (20) foot radius shall be respected between boats during the competition. The use of livewell water treatment chemicals which are legally available in Manitoba is permitted. Marine radios, cellphones, and other communication devices are to be declared at inspection and are only to be used in the case of an emergency during tournament hours. Electronic boat to boat communication is prohibited during tournament hours. Competitors are not permitted to consume alcohol directly before and during tournament hours. Competitors are required to wear approved Personal Floatation Devices whenever the boat is on plane or travelling beyond trolling or drifting speed. Emergency contact number will be provided at rules meeting. All teams must adhere to safe boating practices while participating in the tournament. For the purpose of accounting the safe return of all competitors, all boats are required to check-in at the conclusion of tournament hours regardless if they intend to weigh-in a bag or not. Failure to do so may affect further participation in this event in the following year. Competitors are strictly not permitted to step ashore/off their boat at any time during tournament hours other than at the Paint Lake Lodge Marina. In the case of lightning or other severe dangerous weather competitors can seek safety at the nearest shoreline as necessary. Live baitfish are strictly not permitted to be used on Paint Lake. Live leeches and worms, dead baitfish, and all artificials/lures are permissible. Only fish caught by angling hook and line in a normal manner will be permitted for inclusion in bag limit. Competitors are permitted to use only one (1) line in the water per person at a time. Only walleye, sauger, and saugeye (hereafter designated as ‘fish’) are permitted for inclusion in team bag limit. All other species caught must be released safely back to the water immediately. Team bag limit shall be defined as six (6) fish maximum. At no time shall there be more than six (6) fish in the livewell. Any number of eligible fish less than six (6) in a team bag are also eligible to be brought for weigh-in. Only fish under 55cm or under shall be retained. Any fish touching 55cm or over shall be safely returned to the water immediately. Fish shall not be altered or purposefully deformed in any way. All care for the well-being of any/all fish caught during the tournament shall be of the utmost priority of each competitor. The return of ‘un-releasable’ fish back into the water shall result in disqualification. The weigh-in scale will be located at the Paint Lake Lodge Marina and will be officiated by the Official Weighmaster. 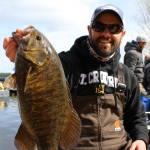 Boats must return to the Paint Lake Lodge Marina and receive a weigh-in order tag from the Check-in Boat on or before their respective check-in time. 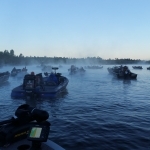 Late boats will be penalized half a pound (8oz) per minute up to 5 minutes, beyond which they will not be eligible to weigh-in/disqualification. The Official Judge Ruler provided by the Tournament Directors will be the sole measuring device used to determine length at weigh-in. Teams may ensure that their own respective measuring devices correlate accurately with the Official Ruler at the Rules Meeting or on the morning before take-off. Fish will be measured with the back of the fish away from the Weighmaster, mouth closed, and tail laid flat as per measuring method set out in 2017 MB Angling Guide. Measurement must be witnessed by at least one team member. All measurements and weights declared by the Weighmaster are final. Official Weighmaster recording of team bag weight shall be in pounds and ounces. One team member shall witness the reading on the weigh-in scale and agree to its accuracy by signing an official team weigh-in slip. Only fish under 55cm will be eligible for weigh-in. Any fish presented for weigh-in determined by the Official Weighmaster to be touching the 55cm mark or over on the Official Judge Ruler will result in disqualification for that team from the tournament. Dead or unreleasable fish will not be eligible for weigh-in but will still count towards that respective team’s tournament bag limit. Dead fish will be determined as any fish not deemed capable of recovery. Stressed fish will be determined in the livewell by a designated Dock Official who will also give the go-ahead to proceed to weigh-in. Each stressed fish will be penalized by half a pound (8oz) from the total team bag weight. Stressed fish will be determined as any fish not swimming upright. Fish shall be brought to the weigh-in scale in provided bags filled with water and supported with a landing net. In the unlikely event that a fish is dropped/mishandled by the Weighmaster and deemed dead or stressed, the team shall not be penalized on their official bag weight. The scale will be open for weigh-in of full/partial bags, or individual fish beginning at 9:00am. This can assist with unnecessarily keeping weighable fish in the livewell all day reducing stress on the fish. Early weigh-in will close at 3:15pm after which each team must wait until their weigh-in order tag number is called. Prizes will be awarded based on highest total team bag weight with the top weight winning first place. Prize placing spots will reflect total entries as determined by the Tournament Directors. Prizes will be awarded on a team basis and must be accepted as awarded. 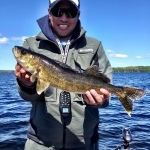 Upon signing the entry/waiver form, competitors are permitting the use of their name and image on all media coverage relating to the promotion and reporting of the Northern Manitoba Walleye Championship. 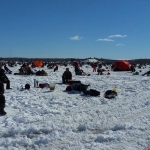 Competitors also free the organizers, volunteers, sponsors, and other agents involved in the above named event of any responsibility for death, injury, damage, theft, or related loss as a result of participating in the Northern Manitoba Walleye Championship howsoever caused. Tournament Directors reserve the right to delay, shorten, or cancel the tournament in the case of severe weather or unsafe conditions. Competitors who have been disqualified will not be entitled to a refund of their entry fee. Any protests of contravention of rules must be submitted directly to the Tournament Organizers accompanied with $200 cash before the completion of weigh-ins. Fee will be refunded if allegations are found to be justified and result in a change in the final standings. Cancellations will be accepted up to and including August 26, 2018. The entry fee will be refunded to the Team Captain less a $50 administration fee. No refunds will be issued after this date. It is the goal of the Tournament Directors to organize a fair and sportsmanlike competitive event, in all cases the ‘spirit of the rule’ will apply.